This downy woodpecker (Picoides pubescens) got caught red-handed — err, gray-footed? To say the residential pest management market has its fair share of bird issues is an understatement. I’ll never forget when we moved into our new home and was awakened by a loud, repetitive banging outside my bedroom window. 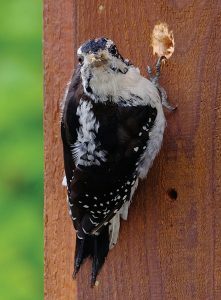 I stuck my head out the window and, lo and behold, I saw a woodpecker drilling away on the side of my home. I thought to myself, Doesn’t this woodpecker know that the Bird Doctor lives here? Who does this crazy bird think he’s dealing with? I then began to feel like the character Carl Spackler in the movie “Caddyshack,” with his laser-focused goal on trying to remove gophers. I’m sure I was mumbling and talking to myself just like Bill Murray did in the movie. Anyway, I did what I needed to do to keep this eager fellow away from the side of my house. Behind shutters and fascia boards. Attics, especially attic fan vents. Under canopies and gazebo roofs. Dryer vents and microwave vents. With that said, numerous opportunities exist for companies specializing in bird management for residential properties. There are so many ways to skin a cat — or shoo a bird, in this instance. It’s always good to speak with industry suppliers of bird deterrent materials if you are uncertain as to the methodology of treatment to exclude or deter birds at an account. Residential customers want the problem fixed, and they don’t want it to ever occur again. This brings up opportunities not only for bird removal, but for being proactive by installing bird deterrents and performing exclusion, bird dropping cleanup and nest removal services. Typically, do-it-yourselfers would either not want to, or are not even able to, perform this type of work. Don’t forget about the mites. When performing bird removal, bird guano cleanup, and bird nesting material removal services, it’s a good idea to also treat for bird mites. If you don’t do it as a preventive treatment once you remove the host birds, you’re setting up yourself or your client for other issues. Always wear the proper personal protective equipment (PPE). Whenever you’re dealing with birds and their droppings, it’s recommended — and usually mandated by law — to wear a respirator, neoprene gloves and a Tyvek uniform, and to use the proper animal-handling equipment. Market the service to new and existing customers alike. Once you provide bird service for your clients, and do it right, they will love you for years to come. This relationship builder often leads to other types of business for your company. Now is the time to assist your clients and potential clients with their summer “to do” lists and offer them residential bird control. You’ll be glad you did. Stuart Aust is president and CEO of Bird Doctor Worldwide and Bug Doctor Nationwide, and vice president of business development for Anticimex. He can be reached at 201-599-1007 or stuart@birddoctorinc.com.